Kinesio tape was developed by Dr. Kenzo Kase in Japan in the early 1970s. Kase aimed to create a taping method for athletics that would assist in muscle and tissue healing without impeding range of motion. Though Kinesio tape had been used in Japan during the early 1980s, it was introduced to the world in 1988 during the Seoul Olympics. Kinesio tape was later introduced to the United States in 1995. Most recently after the Beijing Olympics, Kinesio tape became popular among the non-elite and non-professional active population. Kinesio tape has many unique qualities. It is approximately the same thickness as skin and shares many of the same elastic qualities as skin. Unlike other athletic tape, Kinesio tape is water resistant so tape jobs can last 3-5 days. In addition, the wave-like adhesive mimics fingerprints and the heat activated glue increases the adhesive quality of the tape. The tape leaves no adhesive residue on the skin. Kinesio tape is 100% cotton. Kinesio tape is used by every member of the sports medicine team including physical therapists, athletes, athletic trainers, orthopedics, and chiropractors. There are four uses of Kinesio tape: normalize muscular function, increase circulatory and lymphatic flow, pain management, and correct articular misalignments. The proprioceptive effect of Kinesio tape can help prevent injury by reinforcing proper mechanics and movement. Some studies have seen pain reduce, especially chronic pain from trigger points, after 24 hours. Muscle function: Kinesio tape has been shown to increase range of motion, reduce fatigue, and reduce muscle spasms. In addition, Kinesio tape can help normalize length-tension ratio and modify the bioelectrical activity to increase motor unit recruitment. Garcia-Muro et al (2009) found in a case report that a Kinesio tape job modified the inhibition of the deltoid muscle. The patient had a myofacial trigger point in her anterior and middle deltoid as well as restricted shoulder mobility. Abduction improved significantly after the tape was applied and increased even more two days later. The different application methods for Kinesio tape normalizes length-tension ratio by either stretching overactive muscles or tightening overstretched muscles. Circulatory and lymphatic effects: The spider Kinesio tape technique is used to increase interstitial fluid flow, decrease edema, normalize temperature, increase fluid exchange in tissues, and increase blood flow. This technique is often used after acute injuries to decrease time in the inflammatory phase of healing. Kinesio tape lifts the superficial skin to decrease the pressure and open lymph vessels. This decreases swelling by directing fluid away from congested lymph nodes. Improvements in circulation increases oxygen availability to muscles which enhances athletic performance and strengthens and heals muscles. Though Kinesio tape has many benefits, there are conditions that are contraindicated with Kinesio tape. Malignancy; fragile, healing skin, or sensitive skin; infected skin; open wounds; and deep vein thrombosis are contraindications for Kinesio tape. Since Kinesio tape improves circulation, a deep vein thrombosis and be dislodged. 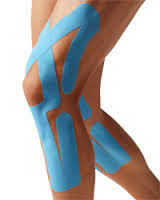 There are also diseases which you should discuss with your doctor before using Kinesio tape. Diabetes and kidney disease are precautionary conditions because doctors worry about increased lymph load due to the increase in lymph drainage. Respiratory conditions and congestive heart failure are other precautionary conditions. While Kinesio tape has shown to have a beneficial role in increasing strength, range of motion, and decrease pain compared to other athletic tapes, more research needs to be conducted to confirm these findings. In addition most of the medical literature supporting Kinesio tape is case studies or anecdotal evidence, experimental research is essential for medical staff to ensure that Kinesio tape is beneficial to athletes. However, if you and your medical team decide that Kinesio tape could be beneficial for your injury or condition, try it out and see what your reaction is. Unlike other medical interventions, there are no known adverse effects to using Kinesio tape so see if it works for you.